For a bright and refreshing update to your space, the Intelligent Design Finn Comforter Set is just the ticket. This geometric design uses an ombre color effect to take the top of the comforter from soft baby blues to deep navy blues at the bottom. Two solid color grey shams accompany this collection for the perfect balance of color and neutral while two decorative pillows play up the top of bed design with the use of embroidery for a cohesive look. For a bright and refreshing update to your space, the Intelligent Design Finn Comforter Set is just the ticket. This geometric design uses an ombre color effect to take the top of the comforter from soft baby blues to deep navy blues at the bottom. One solid color grey sham accompanies this collection for the perfect balance of color and neutral while two decorative pillows play up the top of bed design with the use of embroidery for a cohesive look. Invite a modern touch to your bedroom with the Intelligent Design Clara Comforter Set. 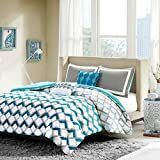 The comforter displays various geometric motifs using a contemporary color palette of Blue and soft grey. 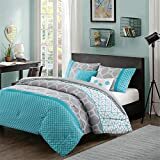 Matching sham(s) incorporate the same geometric motifs on the comforter to bring the bright colors and vibrant patterns to the head of the bed. Two decorative pillows, featuring embroidered hexagons, provide the finishing touches to complete this set. The Intelligent Design Nadia Comforter Set turns any bedroom into fun and inviting getaway. 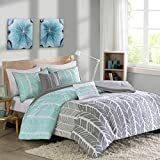 This stylish comforter features a grey and white chevron print broken up by white vertical stripes and a solid teal color that pops! 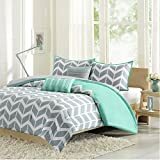 Matching sham(s) with a teal flange pairs exceptionally well with the delightful chevron pattern, while two decorating pillows in coordinating colors help complete the look. Completely reversible, the comforter can flip to a solid grey, for a more neutral look. Made from ultra-soft microfiber, this comforter set is machine washable for easy care.